William H. (Holly) Whyte (1917-1999) is the mentor of Project for Public Spaces because of his seminal work in the study of human behavior in urban settings. While working with the New York City Planning Commission in 1969, Whyte began to wonder how newly planned city spaces were actually working out - something that no one had previously researched. This curiosity led to the Street Life Project, a pioneering study of pedestrian behavior and city dynamics. 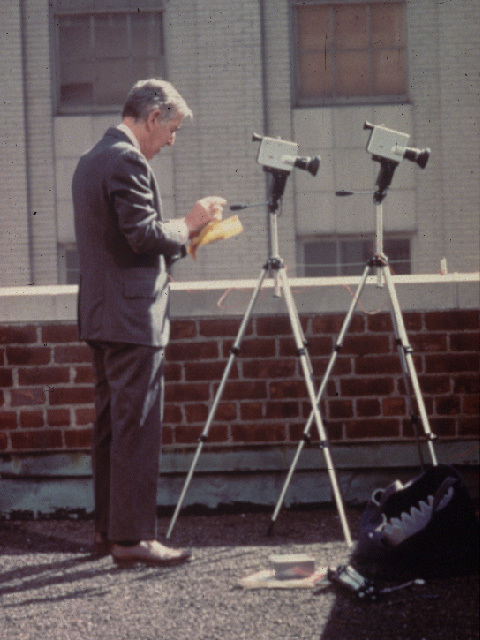 PPS founder and president Fred Kent worked as one of Whyte's research assistants on the Street Life Project, conducting observations and film analyses of corporate plazas, urban streets, parks, and other open spaces in New York City. When Kent founded PPS shortly thereafter, he based the organization largely on Whyte's methods and findings. More than anything, Whyte believed in the perseverance and sanctity of public spaces. For him, small urban places are "priceless," and the city street is "the river of life...where we come together." Whyte's ideas are as relevant today as they were over 30 years ago, and perhaps even more so. Whyte was born in West Chester, Pennsylvania, in 1917. Following his graduating from Princeton University and service in the Marine Corps, he joined the staff of Fortune magazine in 1946. After his book The Organization Man (1956), which was based on his articles about corporate culture and the suburban middle class, sold over two million copies, Whyte turned to issues of sprawl and urban revitalization, which laid the ground for his distinguished career as a sage of sane development and an advocate of cities. In 1969, Whyte assisted the New York City Planning Commission in drafting a comprehensive plan for the city. Dedicated to documenting the progress of recently planned urban spaces, he received a grant to study the street life of New York and other cities in what became known as the Street Life Project. Along with a group of young research assistants, and with camera and notebook in hand, he conducted pioneering research on pedestrian behavior and city dynamics. All told, Whyte walked the city streets for more than 16 years. As unobtrusively as possible, he watched people and used time-lapse photography to chart the meanderings of pedestrians. What emerged through his intuitive analysis is an extremely human, often amusing view of what is staggeringly obvious, but often goes unnoticed, about people's behavior in public spaces. While the core of Whyte's work was predicated on the years he spent on direct observation, he authored several texts about urban planning, design, and human behavior in various urban settings, including: The Exploding Metropolis (1958); Cluster Development (1964); The Last Landscape (1968); The Social Life of Small Urban Spaces (1980); and City: Rediscovery of the Center (1988). Whyte served as an advisor to Laurence S. Rockefeller on environmental issues and as a key planning consultant for major U.S. cities, traveling and lecturing widely. He was a Distinguished Professor at Hunter College of the City University of New York and a trustee of the American Conservation Association, and he was active in the Municipal Art Society, the Hudson River Valley Commission, and President Lyndon B. Johnson's Task Force on Natural Beauty. The Social Life of Public Spaces. Whyte wrote that the social life in public spaces contributes fundamentally to the quality of life of individuals and society as a whole. He believed that we have a moral responsibility to create physical places that facilitate civic engagement and community interaction. Bottom-Up Place Design. Whyte advocated for a new way of designing public spaces - one that was bottom-up, not top-down. Using his approach, design should start with a thorough understanding of the way people use spaces, and the way they would like to use spaces. Whyte noted that people vote with their feet - they use spaces that are easy to use, that are comfortable. They don't use the spaces that are not. The Power of Observation. By observing and by talking to people, Whyte believed, we can learn a great deal about what people want in public spaces and can put this knowledge to work in creating places that shape livable communities. We should therefore enter spaces without theoretical or aesthetic biases, and we should "look hard, with a clean, clear mind, and then look again - and believe what you see." "What attracts people most, it would appear, is other people." "One felicity leads to another. Good places tend to be all of a piece - and the reason can almost always be traced to a human being." "It is difficult to design a space that will not attract people. What is remarkable is how often this has been accomplished." "We are not hapless beings caught in the grip of forces we can do little about, and wholesale damnations of our society only lend a further mystique to organization. Organization has been made by man; it can be changed by man." "The street is the river of life of the city, the place where we come together, the pathway to the center." "If there's a lesson in streetwatching it is that people do like basics -- and as environments go, a street that is open to the sky and filled with people and life is a splendid place to be." "The human backside is a dimension architects seem to have forgotten." "Up to seven people per foot of walkway a minute is a nice bustle"
"There is a rash of studies underway designed to uncover the bad consequences of overcrowding. This is all very well as far as it goes, but it only goes in one direction. What about undercrowding? The researchers would be a lot more objective if they paid as much attention to the possible effects on people of relative isolation and lack of propinquity. Maybe some of those rats they study get lonely too." "So-called 'undesirables' are not the problem. It is the measures taken to combat them that is the problem." "I end then in praise of small spaces. The multiplier effect is tremendous. It is not just the number of people using them, but the larger number who pass by and enjoy them vicariously, or even the larger number who feel better about the city center for knowledge of them. For a city, such places are priceless, whatever the cost. They are built of a set of basics and they are right in front of our noses. If we will look."